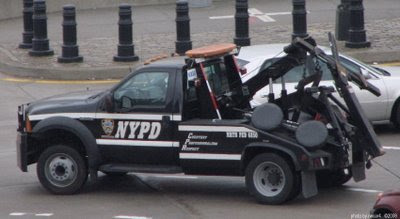 Chinatown residents have reported to CCRC that NYPD tow trucks have been seen towing cars from Baxter Street parking spaces over the last week. 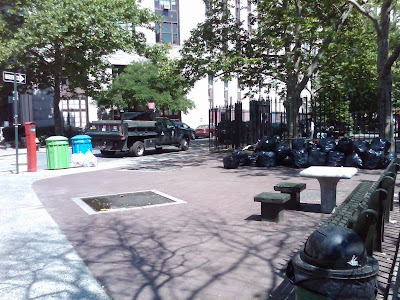 In previous postings on this blog we have shown Parks Department pick up trucks, garbage trucks, and vans parked on the sidewalks at Worth and Baxter Streets. The practice of driving on sidewalks, in some cases five feet from the entrance to the playground at Columbus Park, is not only dangerous and irresponsible, but also downright disrespectful to the Chinatown community. At a recent town hall on transportation hosted by Councilmembers Liu and Gerson, CCRC alerted D.O.T. Lower Manhattan Commissioner Luis Sanchez of the problem. He assured us that he would pass this information on to the Parks Department. Some weeks later, with no progress, CCRC brought the issue, armed with photos to the doorstep of Adrian Benepe NYC Parks Commissioner via a letter. Another two weeks after that we approached the Lower Manhattan Parks Department Commissioner while he was attending the Chinatown Working Group's Town Hall, and again presented the photos and a copy of the letter sent to Adrian Benepe. He promised to call us the next day. He did not. hand delivered letter and photos to Council members Liu and Gerson, our Community Board Chair and the Community Board Transportation Committee Chair. We'd like a commitment from the Parks Department that this "trend" will permanently stop throughout the City's parks. Without so much as an acknowledgement of receipt of the letter and photos there appears to be progress two months after the initial issue was raised by CCRC. As you can see from the photos shown here, a truck that habitually parked on the sidewalk at Worth St. and Baxter, has parked at the sidewalk curb instead. 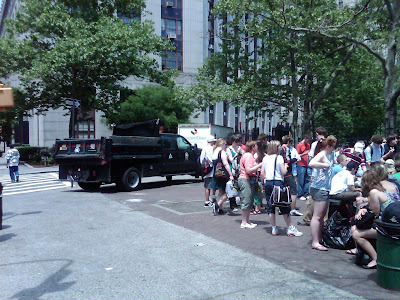 The NYPD must be "helping" the Parks Dept. "find" spaces at the curb by removing offending placard holding vehicles that park in "no standing anytime" spaces. Moral of the story: If you show photo evidence of unsafe conditions caused by government vehicles, take those photos to two council members, a D.O.T. commissioner, the Lower Manhattan Commissioner of Parks, the Commissioner of Parks, the Community Board Transportation Chair, the Community Board Chair, Transportation Alternatives, two Chinese language newspapers, publish the photos on three blog entries on the internet, then YOU TOO can get results from the Parks Dept. and D.O.T. Let's hope we can have a safe summer at Columbus Park. The NYPD makes regular patrols of Worth and Baxter Streets. The offending vehicles, a grey van, a Parks Department pickup truck, and a white pickup truck are no longer around, proof that park goers suspicions were correct - that the drivers of these vehicles were simply parking to use the outdoor jungle gym for exercise. WATCH OUT they are probably at a park near YOU now. Thank you for your vigilance and follow through! We need both more community activists and more responsive local government so that the burden doesn't always fall on a few committed citizens.